"The number of render failures has exceeded its specified failure limit of 0." Yes, this is rendering issue, where some of the resolved items cannot be rendered correctly. Please make note, that when you are publishing item, in most cases you are no publishing JUST THAT ITEM. You are publishing all related items within that transaction also. If any of them fails, your entire transaction will fail, and you will receive this message. To see which one failed, as Atila said, please check "Processed Items" tab of Transaction itself for more details. In the Publish dialog, go to the advanced tab, and set "Ignore Failures While Generating Publishable Content". 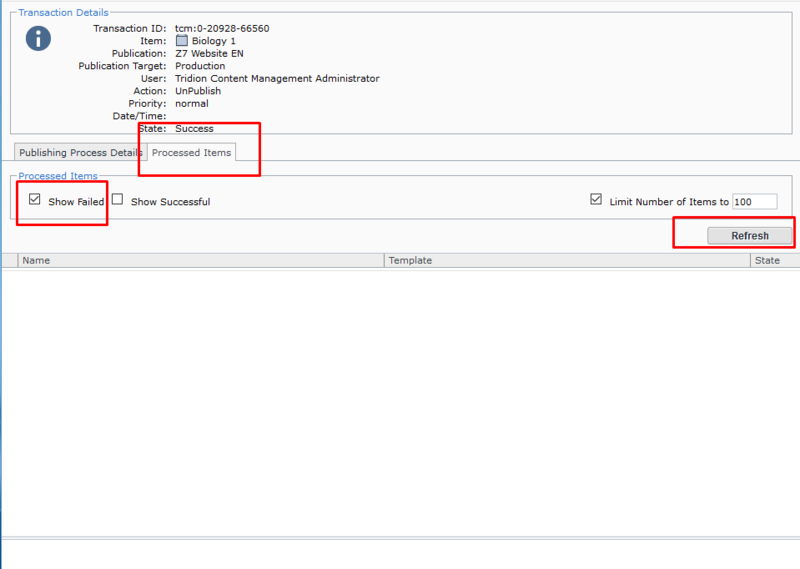 That way the publish will succeed (Warning state), and you will see the failed items when looking at the Publish Transaction. This can be an indication as to what is wrong. Most probably an error while rendering some of the Component Presentations. Not the answer you're looking for? Browse other questions tagged publishing cme publishingfailed or ask your own question. To ensure they publish simultaneously, is it possible to publish pages and components in one transaction using core services?